Jerry Scudero plows the snow from the sidewalk along the by-pass. 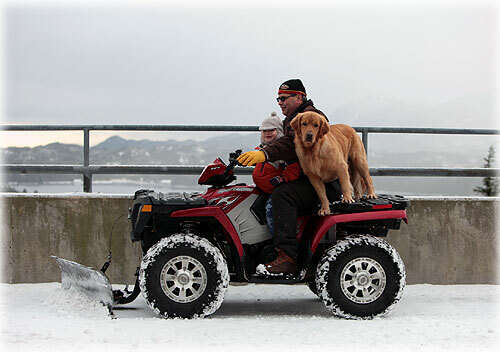 Riding with him is his grandson Kyan Scudero and their dog Michael. Fish Factor: Alaska seafood industry highlights from 2008 By LAINE WELCH - Commercial fishing in Alaska remains a vibrant industry that each year provides more than half our nation's wild caught seafood. Alaska's fishery resources are the envy of other countries around the world, and its management programs are regarded as a model for sustainability. The seafood industry also provides more jobs than the oil/gas, mining, agriculture, forestry and tourism industries combined. High fuel prices that topped $5 per gallon idled 20 percent of Kodiak's trawl fleet, along with hundreds of local seafood workers. Salmon boats stayed out between fishing openers, hurting coastal economies. A petition starting at Petersburg gathered thousands of fishing signatures asking Congress for a tax break from high fuel prices, to no avail. New data from the state Dept. of Labor revealed the average age of Alaska commercial fishermen was 47; nearly 40 percent were non-residents. Southeast Alaska: CRAIG RESIDENT PLEADS GUILTY TO WILDLIFE VIOLATIONS - Acting United States Attorney Karen L. Loeffler announced that Christopher R. Rowland, resident of Craig, Alaska, pleaded guilty in federal court in Anchorage in December to violations of the Lacey Act and the Marine Mammal Protection Act. Rowland, age 41, pleaded guilty to four counts before Chief United States District Court Judge John W. Sedwick. In connection with the guilty plea, Special Assistant United States Attorney John C. Reardon advised the court that Rowland was involved in the illegal taking, transportation and sale of sea otters. 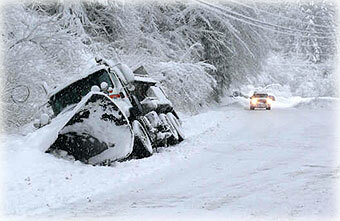 This state DOT plow truck went off-highway last Tuesday morning (December 30th) about 11 am. No injuries were reported save that of the state trooper on-scene who slipped and reportedly broke his ankle. Ketchikan: DOT Selects New Regional Director for Southeast - Alaska Department of Transportation and Public Facilities Commissioner Leo von Scheben announced that he has selected Gary Davis as the regional director to lead the Department of Transportation and Public Facilities' Southeast Region. Davis began the position Monday, Jan. 5th. The regional director is responsible for the overall management of the Southeast Region that includes oversight of the planning, design, construction, maintenance and operations for the state-owned highways, airports and public facilities in Southeast Alaska. Alaska: Alaska traffic fatalities at all time low - Fewer drivers on Alaska's roads perished this year, marking an all time low in traffic fatalities according to the Alaska Department of Transportation and Public Facilities (DOT&PF). As of Dec. 31, 2008, there were 63 traffic fatalities statewide, compared with 82 in 2007. Fatal and major injuries have been on a mostly downward trend since 2003, although they ticked upward in 2007. The Seward Highway has seen a 77 percent reduction in fatal and major injury crashes since the establishment of a safety corridor in May 2006. The Parks Highway safety corridor has resulted in 37 percent decrease. The combination of double fines, reduced speed limits and increased enforcement has made the designation of safety corridors a successful tool in reducing injuries and death. "We are pleased with the decreased number of traffic deaths this year, however 63 fatalities is still 63 too many," said Cindy Cashen, DOT&PF's Alaska Highway Safety Office Administrator. Alaska: Gang problem in south-central Alaska grows By JAMES HALPIN - There's a gang problem in South-Central. But no, we're not talking about Los Angeles. This time, it's Alaska. Documented gangs in Anchorage continue to swell, even as anti-gang officials have pledged to continue their 2-year-old effort to combat youth violence in the south-central region of Alaska. To date, Alaska police say they have identified 112 suspected gangs in Anchorage operating with as many as 1,000 members. Of those, 49 gangs have been validated, including 237 confirmed members. Those numbers are up significantly from past counts. For example, a report police released in late 2007 described 22 confirmed gangs with 150 validated members. In 2006, police counted roughly a dozen known gangs with about 115 validated members. Anchorage police chief Rob Heun said this week that the increase does not necessarily mean there are more gangs, only that police are better at identifying them. "We're becoming more sophisticated in the way we're looking at things," Heun said. "For instance, we're going back into old reports that we've done and we're vetting those to see if it involved gang activity. Let's put it into context: We've had 12 homicides this year; none of them have been gang-motivated." National: Richardson withdrawal taints Obama administration's debut By JOHN IBBITSON - The mess of Bill Richardson's resignation as commerce-secretary-in-waiting eats up more of the goodwill Barack Obama badly needs if he is to implement his audacious agenda -- an agenda that is being undermined by petty state-level scandals. In a statement released to the press Sunday, the New Mexico governor announced that: "I have asked the president-elect not to move forward with my nomination at this time. "I do so with great sorrow. But a pending investigation of a company that has done business with New Mexico state government promises to extend for several weeks or, perhaps, even months." That company is CDR Financial Products, which contributed to Richardson's past campaigns, while also winning $1.5-million in consulting contracts with the state government. A grand jury is investigating whether there was a "pay-to-play" connection in the awarding of the contracts. Travel: What will the travel scene be like in 2009? By SALLY KALSON - To predict the hot travel destinations for 2009, just follow the money. Wherever Americans can get good value for their bucks, that's where travel experts expect them to be flocking in the new year. For example: Iceland, which was so hard hit by the global credit squeeze that its financial system collapsed and the government wound up taking control of the major banks. The value of the krona has dropped precipitously -- a terrible turn of events for Icelanders, but their misfortune means Iceland is now one of the best travel bargains in Europe. The country also happens to offer a bonanza of natural wonders -- glaciers, geysers, mountains, volcanoes, the midnight sun and the Northern Lights -- as well as picturesque fishing villages and the modern city of Reykjavik. There's never been a better time to take it all in, said travel author Pauline Frommer. - More..,. Health - Fitness: Asthma sufferers must switch to eco-friendly inhalers By LORA HINES - Beginning this month, asthma sufferers will have to switch to new, environmentally friendly inhalers to control their attacks. The U.S. Food and Drug Administration has banned production of the old inhalers because they contain chlorofluorocarbons, or CFCs, which scientists say deplete the ozone. They are being replaced by hydrofluoroalkane inhalers, which doctors say give patients the same amount of medicine without harming the environment.